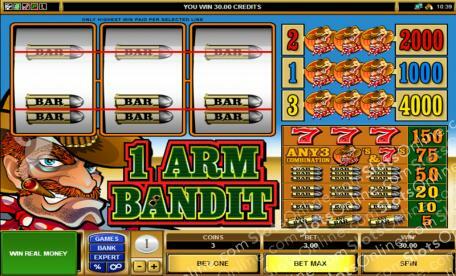 The 1 Arm Bandit is renowned throughout the West as a devious conman and superb gunslinger. Click here to play! He may only have the one arm, but by gum is he fast with it. It's told that he once swindled some millionaire out of a lucrative gold mine while running a dodgy game of Faro. The mark caught on to what was going on, though, came back to the 1 Arm Bandit's joint with a gun, intent on shooting down the villain. Too bad for him that the 1 Arm Bandit, cool as you please, was able to draw his own shooting iron in a heartbeat and shoot the millionaire down. That put the 1 Arm Bandit on the run, but he's back in town now that no bounty hunters have gone after him in years, what with none who go after him surviving. If you've got a quick hand and a watchful eye, you might just be able to get the drop on him. The bounty on his head hasn't gone down at all, so a brave shootist like yourself could easily make a fortune taking out this despicable character. He'll be much harder to take down once he's got some rest, though, so act fast to bring down the 1 Arm Bandit and claim his fortune of gold.